Here are Flax seed Reviews, Flax seed Testimonials and Success Stories that our customers have shared. We know that the whole grains: flax, lignans and barley help people live healthier lives, and it we love to hear specifically how it helps others. Here is what our customers have to say about Flax seed, Flax Hull Lignans, Flax Blaster + Barley! Even at the full price the Cold Milled Flax is still cheaper than Metamucil or other fiber supplements that run about $12 for only 15 ounces! That's a great deal! -K.A. We love to hear from our customers and so do other readers! If you have benefited from our Flaxseed, Flax Hull Lignans Flax Blaster and/or barley, share your stories here! Flax Seed Reviews from Charlie C: I've been using the Flakes Golden Flax seed for 6 months and can feel a difference. I have had mild depression and it has helped with that. Sincerely, Charlie C.
Flax Seed Reviews from Joseph K: Dear Ellie, Thank you for the order and I would like to say that using this flaxseed has changed my life by making my body feel so different that even though I'm 48, I feel like I'm 30 years old. I now rarely use headache pills and hand lotion. My job usually makes my hands dry out, but using the flaxseed makes my skin so soft. My body feels so much better than it ever has. Thank you for the product. -Joseph K.
Flax Seed Reviews from Sheila: Dear Ellie, Thanks for your flaxseeds!! Flax Seed Reviews from Lyndsey G: I discovered this wonderful product at the farm machinery show in Louisville, KY last weekend, and boy am I glad I found it!! I have never had so much natural energy. I'm the type of person that caffeine affects me the opposite way, I get very tired if I consume too much. I am a fitness junkie and this has helped really jump-start my workouts. I can go longer and I workout much harder as well. Also, my mom was diagnosed with breast cancer a few years ago (she is cancer free now!) and it feels good to know that the flax seed lignans will help prevent this type of cancer. Her cancer was caused by her HRT that her doctor placed her on years back. It was an estrogen-induced cancer. Cancer and heart problems run in both sides of my family, this is another reason why Flax got my attention. So thanks Ellie for being at the farm show, I will keep in touch, I will be ordering again soon. Breast Cancer Prevention + Hot Flashes Gone! Flax Seed Testimonials from Mary E.: I am in re-mission from Stage II breast cancer, after going through surgeries, chemo + radiation. I must take Tamoxifen every day, which caused me to have multiple hot flashes each hour of each day. I was experiencing up to 100 hot flashes/day before I found Flax Hull Lignans, which help to reduce hot flashes. Taking both Flax + Flax Hull Lignans has reduced the occurrence + reoccurrence of Breast Cancer. My hot flashes have completely disappeared + thanks to the elimination of hot flashes, my quality of life has improved dramatically. ~Mary E.
Read Mary's entire story about Flaxseed and Breast Cancer Prevention + Flax for Hot Flashes. Flax Seed Testimonials from Sherrie: I have several health problems: Type 2 Diabetes + Constipation being my top complaints. When I was introduced to Golden Flax seed, I was drinking fiber daily + lived on Senna. I no longer have to buy Senna or fiber. My hot flashes were so bad and I had up to 3 or 4 times in the night. My sleep was interrupted, not to mention the embarrassment of breaking out in a sweat and a red face during conversations.... Oh boy, I have not had a hot flash for about 3 weeks. Read all of Sherrie's Story Flaxseed and Diabetes, flaxseed for constipation, flaxseed and hot flashes, and flaxseed for skin here. Normal Cholesterol + Improved Eczema! To Read Michelle's full story, click Flaxseed for Eczema, Flaxseed for Cholesterol - Normal Cholesterol + Improved Eczema! Flax Seed Testimonials from Paul K.: I am 86 years old. I was considering knee replacement surgery and was having a lot of joint pain in my knees, ankles, and arms. 2 months ago I started using flaxseed along with going to a chiropractor and I am convinced flax has greatly diminished my pain. I have also had less throat phlegm and mucous. Sincerely, Paul K.
Flax Seed Reviews from Dave S: The quality and taste of your flax was FAR BETTER than the flax I found at both Costco + Sam's Club. I also noticed more benefits with your flax. So, a couple dollars more for Much Better Flax is definitely worth it to me. I'm glad to know that I am supporting local farmers + to know my flax isn't coming from unregulated countries like China + other countries. Thanks, Dave S.
Flax Seed Testimonials from Monica S.: I have been very pleased with the results I have had since taking the Flax Hull Lignans + the Flakes o Gold. I am sleeping so much better at night. I'm not experiencing the night sweats, the anxiety feelings that I had been having. Flax Seed Testimonials from L.P.: I have been using the flax and the flax lignans for approximately 6 months. Prior to this it was suspected that I might have endometriosis as evidenced by severe abdominal pain for 2-3 weeks prior to my cycle, very heavy cycles, and mood swings. Thank you very much for the Flakes O' Gold. We have been customers since Grandma's Marathon in 2007. Flax seed is great for runners and even better for our kids (ages 5 and 2). Thank you very much! ~Mike S.
Flax Seed Reviews from Michelle H.: Thank you for selling my family Golden Flax seed and the Flax Hull Lignans. We all are benefiting from them. I am pregnant. I have had a very tough time with this pregnancy up until I tried your product. I was very ill all the time and I was eating small snacks every hour. Once I tried the flax, I have felt like my self again and I can eat like normal again. Thank you so much for introducing me to the flax and the flax hull lignans. Sincerely, Michelle H.
P.S. My husband and my 3 yr old son really like the flax also! Thanks Ellie -Grateful to be able to have this quality flax. 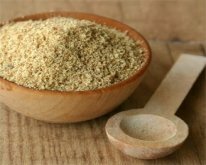 -Dorothy S.
Flax Seed Testimonials from Kori M.: I am 47 years old and have taken golden flax seed for the past two months along with lignans. I was experiencing extreme hot flashes and I don't have them anymore thanks to the lignans that I take daily. Since I started on the flax seed I can lift from 10 to 30 pound more on the machines and I don't get as tired or sore as I used to after lifting weights and doing cardio. It is amazing when I go to the gym I feel great and not fatigued. Taking golden flax seed and lignans has also helped me mentally to focus and I feel balanced. Flax Seed Testimonials from Rhonda D.: I have suffered from period migraines for the past 20 years. I have tried everything from holistic products to over the counter migraine products. I tried the Flax Hull Lignans, and I can honestly say that I am a true believer of Ellie's advice. Flax Hull Lignans totally saved me. To Read Rhondai's full story, click Period Migraine Relief. Flax Seed Testimonials from Ginger S.: I came across Flakes o' Gold Flax seed at the Mill City Farmers Market in Minneapolis last summer. Thank You, Ellie. We were thrilled it arrived so fast. -Arden and Dee J. My mind seems clearer, I feel better and my trouble sleeping at night has improved immensely. Thank you again for blessing me. ~Liz B. To Read Liz's full story, click Flax helps Sleep. Thank you so much for the flax and lignans. Thank you for caring about our health. I enjoy talking with you and appreciate the friendly service you provide. Thanks, Katherine M. PS. I think this is my 4th case. People keep asking me to get more! Thank you for this delicious, nutritious ground flax! You can count on me as a steady customer and I'll tell others. Gratefully, Dorothy S.
Flax Seed Testimonials from Carlyn G.: Thank you Ellie, for the promptness you sent my order. And thank you for the Barely info. Your website is one of my favorites, especially the flax recipes and info. I've copied some of it and given it out to people I work with. -Carlyn G.
Flax Seed Reviews from Susan V: Hi, I purchased the 40 oz size of Flakes O' Gold at the MN State Fair last year. I've recently started using it consistently for cholesterol lowering benefits and found it helpful for constipation. I gave some to my 92 yr old mother in law for constipation relief after commonly prescribed remedies did not work for her and she's had great results. Many Thanks for introducing us to a great product. I just eat it by the spoonful and follow with water. -Susan V.
Ellie, Now 15 teachers are on Flax at Elmwood. -Y.M. Boy! did I feel it in my hip joint... sore again after being pain free for years! And my hair lost it's shine... Wow! What a testament to the benefits of flax!! Flax Seed Testimonials from Deb R: Dear Ellie, I am very impressed with the way I felt while using your Flax Hull Lignans and Ground Flax. I began to have more energy and my digestive system seems to be better. I had a puffiness just below and between my breastbone that seems to be diminished. I ran out and I miss it!! Thanks, Deb M.
Thanks Ellie - We love the flax and I've got the whole family eating it now. -Nans T.
Flax Seed Reviews from Mary A.: Dear Ellie, What a pleasure to meet you at the State Fair. Since adding Flakes o' Gold to my oatmeal every morning, I have notifced my fingernails are stronger and my hair has a better texture. I turned 60 in August and I am always on the look out for ways to living a healthier life. Your product also seems to give me more energy! Thank you for convincing me that this was a needed nutrient in my diet! Sincerely yours, Mary A. Your Flax -Better than the Store Brands! Flax Seed Testimonials from Phyllis L.: Ellie, Thank you so very much for your product! And also for taking time to educate me on the phone the other day. I am so very happy that this is an all-natural cure to my ever-changing hormones! I would much rather use "God's" creation to heal myself than putting chemicals into my body. My doctor also uses flax seed, but has not heard of the "Flax Hull Lignans" and he is glad to offer women an alternative to anti-depression drugs. I will be in touch when it is time for my refills. God Bless, Phyllis L.
Dear Ellie, I received your package in the mail and want to thank you for the Flaxseed and book. We've been purchasing the 40 oz Flax at the fair the past few years. We'll enjoy the recipes and info. Again Thank you, Sincerely, Linda V.
Good Morning Ellie, I was at the MN State Fair last summer and bough some of the flax seed. I use it daily in my yogurt or on my oatmeal. I love the tate and am so glad I found a good source of seeds. Since I am in MN very often the shipping is very handy. Thanks for a great product. -Marlene P.
Leave Flax Seed Reviews + Flax seed Testimonials page to go buy Quality Flax.